Black-Footed Cats are one of the smallest species of cat. They have a body length between 34 and 50 cms (13.5 - 20 inches), a tail length between 15 and 20 cms (6 - 8 inches) and they weigh between 1.5 and 3 kgs (3.25 - 6.5 lbs). They are pale brown in colour with dark spots on their back, sides and stomach. 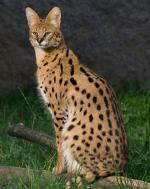 They have dark stripes on their cheeks, legs and tail and their tail also has a dark tip. The undersides of their feet are black, which is where they get their common name. 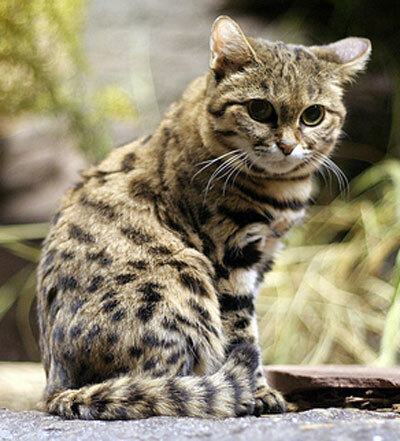 Black-Footed Cats can be found in the savannah and steppe regions of southern Africa. They are solitary and are mainly active during the night. Males have a home range that averages 13 - 20 sq kms where as females have smaller ranges that average 10 - 12 sq kms. Home ranges often overlap but individuals spend little time together and they mark their range with urine sprays. Black-Footed Cats mainly feed on mice, small lizards, birds and insects. They are well adapted to their habitat and they rarely need to drink water. Black-Footed Cats breed between spring and autumn and they can produce up to 4 litters per year, but fewer litters are more common. After a gestation period of 63 - 68 days, they give birth to a litter of 1 - 3 kittens. At birth the kittens weigh between 60 and 85 g (2.1 - 3 oz) and they are weaned by the time they are 6 weeks old. They reach independence at 5 months old but they may remain in their mother's range for a little longer. They reach sexual maturity at 1 - 2 years of age. 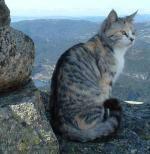 Little is known about predators of the Black-Footed Cat.